These feminized hymns are the focus of "I Sing for I Cannot Be Silent." Drawing upon her own experience as a Baptist, June Hadden Hobbs argues that the evangelical tradition is an oral tradition--it is not anti-intellectual but antiprint. Evangelicals rely on memory and spontaneous oral improvisation; hymns serve to aid memory and permit interaction between oral and written language. 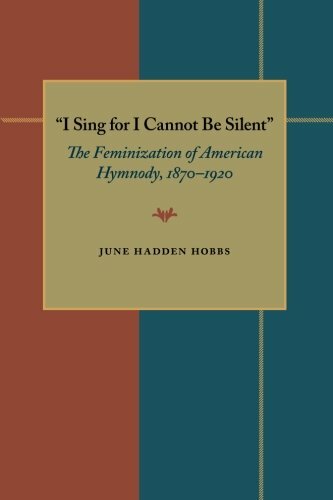 In "I Sing for I Cannot Be Silent" June Hadden Hobbs employs an interdisciplinary mix of feminist literary analysis, social history, rhetoric and composition theory, hymnology, autobiography, and theology to examine hymns central to worship in most evangelical churches today. If you have any questions about this product by Brand: University of Pittsburgh Press, contact us by completing and submitting the form below. If you are looking for a specif part number, please include it with your message.